November 27, 2016, 4:56 AM · UTRECHT, Netherlands - 1967 was a legendary year in the violin world: the Queen Elisabeth Competition was host to an astonishing array of musical talent including Gidon Kremer and Phillip Hirshhorn (take note several spellings of the artist’s name extant: Philippe Hirschhorn/ Philipp Hirshhorn). A half century ago, the cross-pollination between cultural centers in the Soviet Union and other parts of the world was frozen by Cold War politics. The Queen Elisabeth Competition in Brussels was a meeting place for the best and brightest, the 1967 violin competition was no exception what with the likes of Jean-Jacques Kantorow, Joshua Epstein and Uri Pianka as laureates. Quaking with awe, the Belgian aristocrat who provided this quote with a promise of anonymity hid a tape player in her purse and recorded Hirschhorn’s rendition of Paganini’s First Violin Concerto live from the hall. The recording was soon to become a collector’s item: Hirshhorn the First Prize winner did not become a globetrotting artist or a recording company’s darling. In the words of the ultra self-critical Hirshhorn, “I did something tricky, it was a successful lie, and I convinced the jury that I was the winner.” To convince renowned jury members exemplified by Joseph Gingold, Arthur Grumiaux, Yehudi Menuhin, David Oistrakh, Max Rostal, and Joseph Szigeti did not call for deception; Hirshhorn was a musical genius and like all too many bright lights, died young. 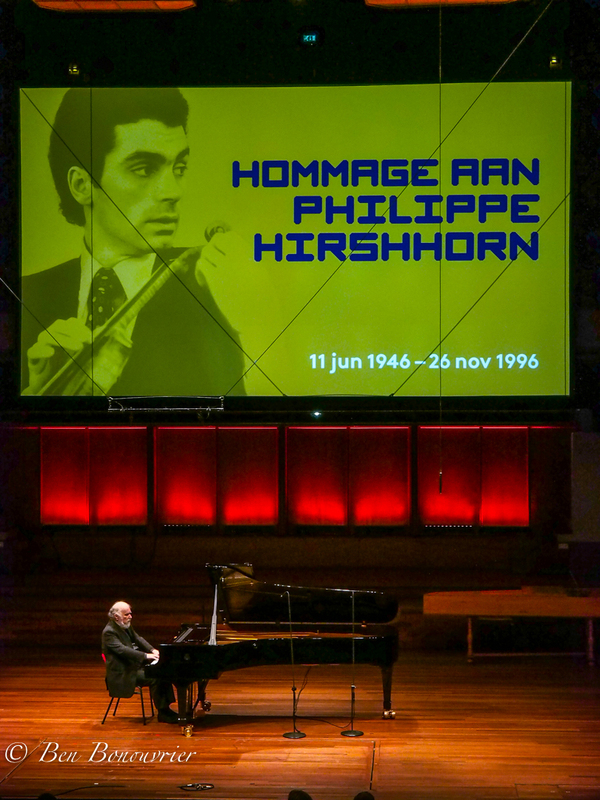 His performances and treasured recordings carved indelible memories on all privileged to have ‘been there.’ His students at the Utrecht and Brussels conservatories in the late 1980s and early 90s spoke of lessons and master classes with wonder. One of his students, Dmitri Makhtin a top prize winner at Spohr, Paganini and Montreal Competitions, decided to gather some of Hirshhorn’s beloved students and chamber music partners to pay homage to the master in Utrecht, the city where Hirshhorn and Russian compatriot, Viktor Liberman had attracted scores of top violinists three decades ago. The answer to the question as to why such an extraordinary musician never enjoyed a world-class career is complex. To Hirshhorn’s lifelong friend and musical voyager, cellist Mischa Maisky, the problem related to nerves compounded by a hypersensitivity to the hypocrisy of the music world and its adulation of superstars, youth and extraneous qualities not integral to musical exploration. Pianist Elisabeth Leonskaja, who collaborated with Hirshhorn for decades, observed that he was so supremely gifted and so attuned to every aspect of the challenges of mastering an instrument that he was “closer to perfection” than other great talents. This proximity brought overwhelming feelings of frustration and self-doubt that ultimately overshadowed his life. Yet, as Hirshhorn’s students great and small aver, Hirshhorn always brought an abundant generosity of spirit to his lessons. 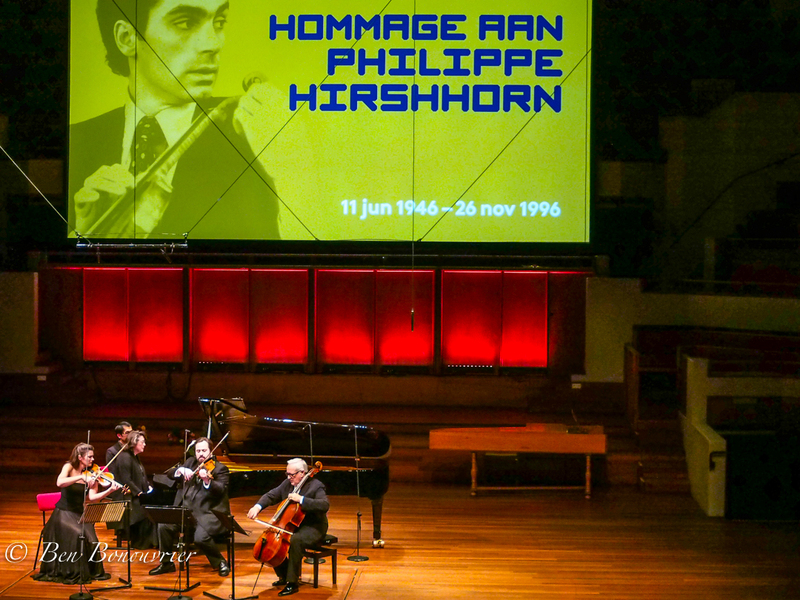 To Janine Jansen, lessons were ‘electrifying.’ Hirshhorn’s motto, “as a musician you should be concerned with attitude, not the target” became the guiding light to a generation of young artists. Strangely, sadness rather than a celebration of a life permeated the hall; several of Hirshhorn’s close friends were visibly shattered by the mere fact that the Homage took place on the artist’s death date rather than his birthdate. The opening harmonics of Shostakovich Trio performed by Dmitri Makhtin, David Geringas and Elisabeth Leonskaja ushered in an evening of musical depth interspersed by excerpts taken from the heart-wrenching documentary, The Winners in which HIrshhorn and other top prize winners who never ‘made it’ in terms of career criteria shared innermost feelings. Homage is a tribute, a gathering to show public acknowledgment. Although several performances within the potpourri presented were under-rehearsed, there were enough memorable moments to conjure Hirshhorn’s power to produce unimpeded phrases, to give more than humanly possible. Throughout the evening every member of the audience felt as if they had been empowered, as if Hirshhorn had come back ‘home’ in some mystical, magic way. Janine Jansen’s playing throughout Brahms Piano Quartet opus 60 brought that mélange of intensity and freedom that hearkens back to Hirshhorn in his golden period to life. Although colleague Olga Martinova and former students Philippe Graffin and Liza Ferschtman did not take part at the Homage, master pianist Radu Lupu provided a highpoint in the musical offerings. Playing without any sense of strain or cognizance of limitation, his interpretation of Haydn’s quietly dramatic Andante con variazioni opened a floodgate of emotion. The spirit of Hirshhorn filled the hall as raw edges of emotion turned to love. As midnight approached, Jansen and Makhtin soloed in a spirited Bach Double in which two strikingly different conceptions of the piece came to the fore. Perhaps Phillip Hirshhorn deserves the last word, a musical word to carry us forward in his spirit. Along with the pathos and bravura of his legendary Paganini, a live recording from the Queen Elisabeth Competition 1967, the Ysaye arrangement of Saint-Saens’ Caprice for Violin and Piano d’apres l’etude en forme de valse is the stuff dreams are made of. November 28, 2016 at 07:23 PM · Any recording of his is always a contender for my favorite version. November 28, 2016 at 10:57 PM · It must NOT be forgotten the touching Fantasy of Schubert for four hands in F minor (D. 940) played by Leonskaja and Lupu. A unic chance to listen to them on the same keyboard!